The Nut Family Climbs a Mountain to See the Pretty Leaves. Feeling a little blue? I’ve got just the thing. Cheapest therapy your $6.95 can buy. It’s Googly Eyes by the editors of Klutz. Not only is the book a hoot, with hilarious pictures and clever captions, but it comes with oodles of googly eyes. (Wow, that phrase is really fun to say!) Yes, you too can instantly bring common, ordinary household objects alive! Be the life of the party! Thrill to the silliness! 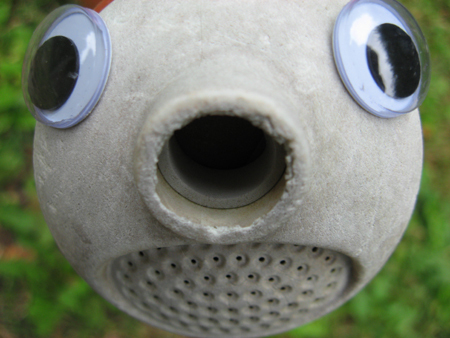 Below are the pictures I took of my own googly-eyed critters. Yes, those are my groaningly silly captions, with the name of the transformed ordinary object below it. (I make no apologies for my puns! Read at your own risk!) The pictures (and captions) in the book are even funnier than mine, but it was more fun to come up with my own, even if they’re not as humorous. At least they made us laugh. A lot. But then, we are easily amused. Its bark is worse than its bite. Oooh, my eyes are watering! This entry was posted on October 14, 2007 at 5:52 pm and is filed under Living Simply, Silliness. You can follow any responses to this entry through the RSS 2.0 feed. You can leave a response, or trackback from your own site. My wife would see this and tell me: you and your internet friends have too much time on your hands. I say NAY: the EYES have it! Be sure to watch it for the bows at the end. You may have to click more than once on the Start arrow. Click here: Bird Lovers Only Rescue: May I have this dance? This looks like more fun than magnetic poetry and is right up my alley! I’m not kidding, I’m going to head over to Schoolhouse fabrics and get me some of my very own googly eyes. I agree that leaving googly eyes in unlikely places could be likened to a healing mission. You certainly had me smiling! That’s hilarious! Definitely made me smile this morning. Very clever, too. I esp. liked the ones with the flowers. Sorry you couldn’t access the bird that dances on a chair back. He was on TV this morning, but all the lights & the audience & two talking hosts apparently made him nervous, as he would only take a few tentative steps. BTW: I bought a 96 cent rubber dog toy, purple & pink, with huge eyes, for my Yorkie mix pup. We call it her Googlie; it makes multiple squeaky noises & is her very favorite toy. We even have to put it up high when one of us wants respite from her tossing it around. Very cute and looks like fun. You did so well on the photos! you are so awesome! those are the best photos I’ve seen in a long time 🙂 Oh, the joy! love it!!!! very clever captions…. i think i may have to go find some googly eyes! It gives “Toy Story” a whole new dimension. I’m going to be pretty much immobilized from now on imagining all that *watching* me! can I use for my profile on you tube? Sure, John, I’d be happy for you to use my picture. Thanks for asking. I’d be glad for you to use my picture…thanks for asking! Didn’t see this until that Daily News put it on their website–Photoshop or not, it’s funny!